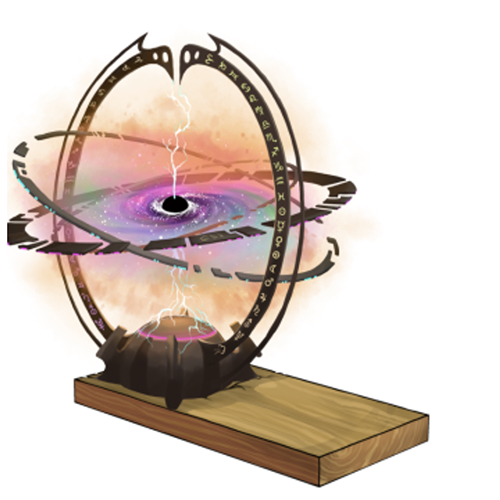 The Event Horizon is an Arcane type weapon. A piece of cheese is placed upon a trigger at the exact event horizon of this trap. Any mouse caught lingering long enough for the machine to spin up completely will be caught within the artificial black hole's gravitational pull. Once a mouse crosses the event horizon, the gravitational pull becomes so strong that escape becomes impossible! Although, you won't really see this happen. As the mice pass through the horizon, they will appear to freeze in place as they fall infinitely into the center, slowly redshifting until they eventually disappear from sight. The mouse, however, will experience gravity at a magnitude so strong that it will experience something known as "spaghettification". This is a very scientific term which means it will be stretched out into a long length of atoms, laid out side by side, resembling a string of spaghetti, pulled infinitely apart until the space between them is so great that only darkness remains. At least... That's what is believed will happen. No one has ever gone in and returned to tell about it, or properly observed it. Perhaps a hunter will reach too close by mistake when placing their cheese and become an unwilling test subject. Their noble and honourable sacrifice will prove to be invaluable to the world of science. The Event Horizon is not sold by any Trapsmith. It can only be crafted given the proper ingredients. Infinite Winter Horizon Trap - Requires Event Horizon Trap Parts for crafting. New Horizon Trap - Requires Event Horizon Trap Parts for crafting. Smashing this weapon with the Hunter's Hammer yields Event Horizon Trap Parts. 9 September 2015: The Event Horizon was introduced as part of the Hollow Heights release. 29 December 2016: The ability to smash the Event Horizon Trap was added.